5/6 - bed marvelously sunny mobile homes, fully-furnished with bathroom, AC and an outdoor veranda. Located directly on the lake. More than 6,000 square metres for your children. Thick tree coverage spread throughout the camp. 580 well-shaded individual sites of various sizes and categories, all equipped with electricity plugs and easy access to the bathroom and washing facilities. Eurocamping Pacengo is situated directly on the lake facing a long beach at Pacengo di Lazise – a pretty little historical village at the heart of Lake Garda. 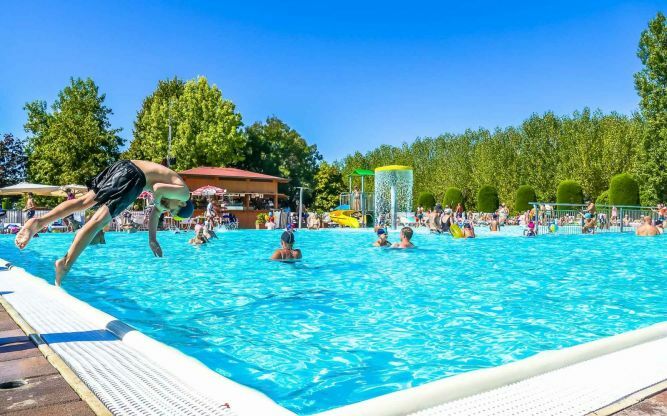 The camping site is just a few kilometers from the biggest theme parks in Italy: Gardaland, Acqua Studios, Movieland Studios and Parco Natura Viva. The camping site extends over an area of ten hectares entirely covered with trees, and within these grounds, a solution can be found to every camper’s needs – from the smallest tent to a maxi caravan. The camping areas include well-shaded individual sites of various sizes and categories, all equipped with electricity plugs and easy access to the bathroom and washing facilities. You can choose your ideal position from different areas of the park, just a few yards from the Lake or in the midst of the thick woodland. There is also the option of staying in 5/6 - bed marvelously sunny mobile homes, fully-furnished with bathroom, AC, and an outdoor veranda. The camping site is equipped with a spacious and modern swimming pool complete with water games and a small laguna for the kids, and deck chairs and sun beds for adults, as well as a well-stocked bar that is open day and evening too. 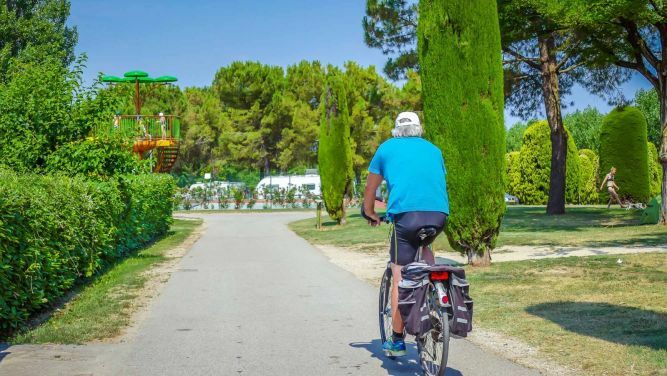 The Campsite is located in Pacengo, it overlooks the lake, between Lazise and Peschiera, two of the most beautiful towns on Lake Garda easily reachable with a bike path running along the lake. It's just a few kilometres from the largest amusement parks in Italy: Gardaland, Caneva Aquapark, Movieland, Parco Natura Viva, Parco delle Cascate di Molina, Parco Giardino Sigurtà, Parco Termale Villa dei Cedri. And many more.